It is time for an upgrade! One of my favorite things about vaping is when the finally find that all day vape flavor. Just that one e juice that no matter what every hit seems to be better than the last one. BLVK Unicorn accomplished this when they released their first line of flavors. They were delicious and punctual. Now BLVK Unicorn is back with a new line of flavors by the name of WYTE Bottle! 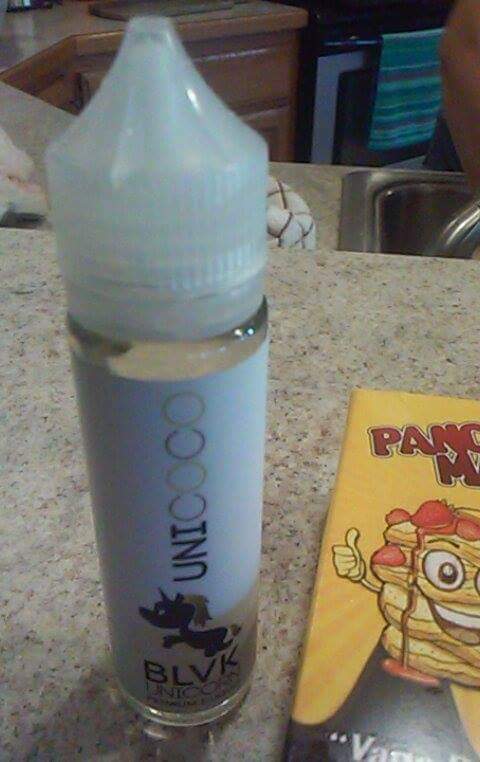 One of the most popular flavors right now is UniCoco E Juice by BLVK Unicorn 60ML. It has the flavor profile of a fresh picked pear that is served with some tropical coconut! The inhale consist of that coconut taste that instantly brings your brain to the most beautiful landscape on earth. Upon exhaling UniCoco E Juice by BLVK Unicorn 60ML is when the pear comes to play and leaves an everlasting taste on the tip of your tongue. The throat hit is smooth and subtle. It is also very refreshing. There is no burning or charring sensation that will cause coughing and irritation. The bottle design is very clever considering their last design of bottles. The WYTE Bottle line is still produced into premade unicorn bottles except instead of black; they are white! Anyone who walks by will notice these bottles instantly. The label is still holographic and has the BLVK Unicorn brand logo on it along with the corresponding flavor. UniCoco E Juice by BLVK Unicorn 60ML has a MAX VG mixture which means the flavor will be extremely tasty along with producing huge clouds. Here at E Cigarette Empire we carry this premium vape liquid in a 60ML bottle size with nicotine levels of 0MG, 3MG, and 6MG. Come take a taste bud vacation with this new delicious flavor! Pear & coconut was a popular profile when I began vaping 2+ yrs ago but over time it became scarce. I was, therefore, delighted to find Unicoco. It rivals the best pear/coconut combo I've ever had. really good ! I can't stop vaping this juice with my dvpro and apocalypse rda ! great flavor not too sweet and i feel the coconut love it ! Meh... has a weird chemical smell and taste like some of the cheap juices I bought online years ago for six bucks (giant cheapo plastic bottle).